Now you see the reason for the code name. It's orange! 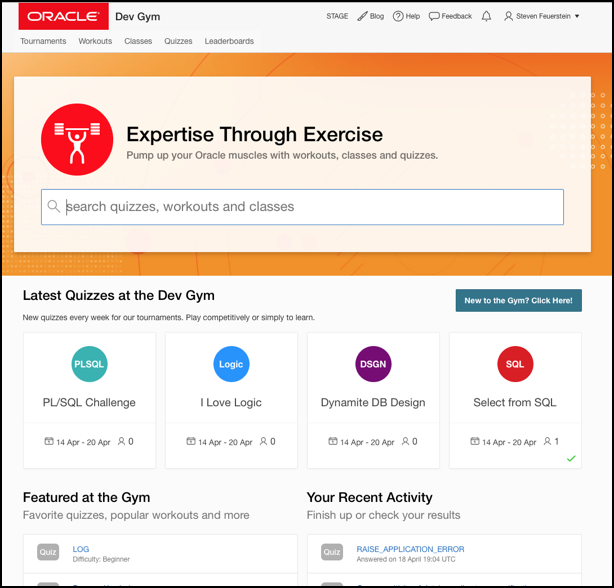 Orange theme: all that red was hurting our eyes, but the main reason to switch to orange was to make it visually clear that this site, as with AskTOM, is part of the broader Oracle Developer initiative. Site search: type in a keyword, such as "FORALL" or "listagg" in the search bar on the home page, and we will find all quizzes, workouts and classes that match your criteria. You can further hone your search on the results page. The tournament quizzes are now offered on the home page; no need to click on the Tournaments tab to see them. 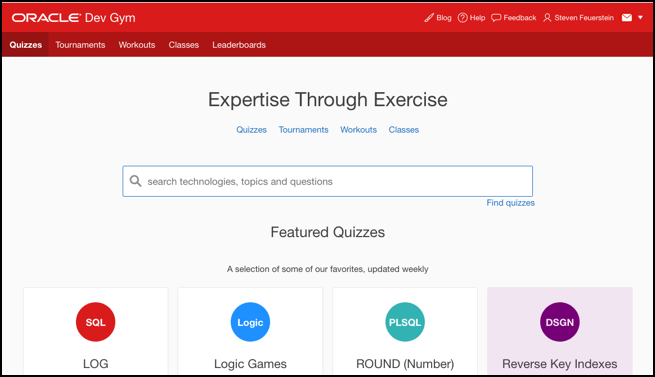 These quizzes are produced fresh each week, and often focus on the latest features in SQL, PL/SQL and Oracle Database. Your recent activity on the site is available on the home page so that you can more easily continue your workout or class, or check the results of a recently-completed quiz. Improved performance on the Tournament Archive (formerly Library) page, the Quizzes Taken page and more. Redesigned workouts and classes page to make it easier to find and take these exercises at the gym. The Trivadis class (which consisted of a single workout) is now a workout. All classes on the Dev Gym henceforth will consist of multiple modules. If you were in the middle of taking that class, visit the Workouts page to continue via the workout. Looking ahead, we will be announcing at least two new classes on the Dev Gym over the next several months (Databases for Developers: Next Level by Chris Saxon and SQL Analytics for Developers by Connor McDonald). And in June we plan to launch a brand-new weekly Java quiz!